Helen Starr, founder of The Mechatronic Library, leads a discussion of reality, vulnerability and addiction in the digital age. Artcore would like to invite you to our latest Artist Talk, Designed to Addict! 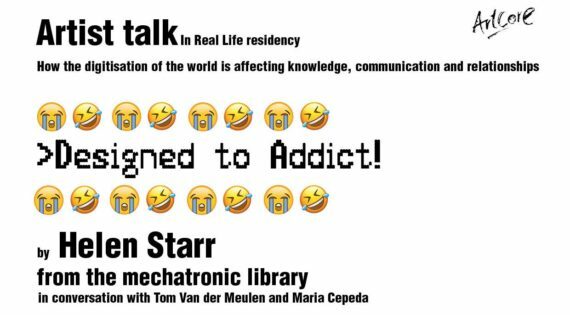 This talk is part of our In Real Life residency exploring ideas of artificial intelligence, digital avatars, and our addiction to social media. The speaker for the event is Helen Starr, founder of The Mechatronic Library, who will be leading a discussion on the gamification of machine learning and how social media algorithms are designed to trigger a dopamine high and trap us in a social-validation feedback loop. Helen will be in conversation with our two artists in residence, Tom Van Der Meulen and Maria Cepeda, who will discuss how their art is inspired and influenced by the digital world. The Artist talk is free, open to all, and will include some time for networking and refreshments. It will run from 11am – 1pm on Thursday 27th September at Artcore in Derby.